THIS COMPETITION IS NOW CLOSED, THE WINNER HAS BEEN ANNOUNCED HERE. YOU CAN SEE OUR CURRENT COMPETITION HERE. This week we’re delighted to be able to give-away this beautiful vintage needlepoint bag, thanks to the lovely Evelyn at I Love VintageBagz who sells a beautiful array of vintage bags, belts, shoes and jewellery. The bag we’re giving away is a stunning vintage black fabric bag with petit point detailed tapestry depicting a pink and red flower with green leaves. The bag is completed by it’s original paperclip-style chain handle. The ornate pewter frame features a glorious engraved pattern. This vintage bag is fully lined with black cross grain fabric and features a small open gusset pocket. When you open the bag you cannot miss the eye-catching pink, black and yellow criss cross stitching surrounding the frame. 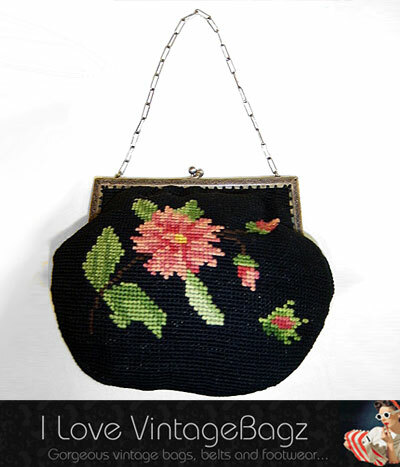 A truly beautiful and elegant vintage bag that would work well with a deep red or emerald-green long satin evening gown. The bag is circa 1930s and is in very good condition with minimal wear. Simply comment below and answer this question: Accessories can definitely make your outfit – tell us about the outfit you would wear with this beautiful bag for your chance to win. We’ll pick a winner after entries close on Thursday 29th March. The winner will be announced on this blog soon afterwards so don’t forget to check back or subscribe! Please note: This competition is open to UK residents only, as the prize will only be shipped within the UK. We will contact the winner shortly afterwards and pass their details onto I Love VintageBagz who will send out the prize directly. This bag has a multitude of outfits… the little black dress for drinks after work, the office power suit for a little frivolous femininity, even skinny blue jeans and a white shirt. The question you should have asked was – Which outfit in your wardrobe does this bag NOT work with? Skiiny jeans, obscenely high heels and a pintuck chambray shirt. its lovely i would wear it with a nice black dress on my next girls night out! I have a black satin dress with pink embroidered flowers which would match beautifully with this! I’d wear this bag with a plain, peachy maxi dress. Wow, this is a gorgeous bag, if I owned it, I would team it up with one of my mini dresses, either black or coral dress. I’d wear this with absolutely anything. It’s so divine, to hell with fashion ‘rules’! with my lovely strappy black dress,the hand bag would compliment the beautiful embroidery on the front of the dress. I have the perfect LBD to let this beautiful bag stand out. I have a little vintage black dress that I love to wear when I go out on special occasions. I would love to have the purse to go with it.. It is lovely! I’d match it with my golfing Plusfours and paisley jumper. I am a huge Cath Kidston fan so own many of her 50’s dresses and floral tea dresses! I have a gorgeous pink floral CK dress which I wear with a little black cardi. This bag would match perfectly! I would wear a lovely black tunic, black leggings, high heels for a simple look and the bag would finish the outfit off. It is gorgeous! wow this would work with so many outfits. Skinny jeans and plain white blouse and chunky necklace would look great. A vintage black lace dress. Oh I’m so jealous that I can’t enter b/c I live in Canada! We are having a ladies night with the theme of “mafia mamas” so I’m trying to find 1920s/1930s stuff to wear, and that would work perfectly with a black dress that I’m going to make over Easter. Very sad I can’t enter :(. I know the perfect vintage dress that would look amazing with this…. I just need a reason strong enough to convince my mum to give it to me…. I would style it with my black gypsy dress. I WOULD WEAR THIS WITH MY JIMMY CHOOS, MANKINI AND FAKE MOUSTASHE. My Wife adores little bags and vintage are what she calls “bags with attitude”! this little number has lots of attitude, I would love to surprise her with it! I’d wear it with jeans and a floral top! id wear some nice black skinnys with some black stillettos a nice blouse and a chunky bangle! A long black evening gown with a beaded hem and neckline to match the bag. A little black dress so as not to distract from the bag – it deserves to be the star! This gorgeous bag would look perfect with a black pencil skirt, crisp white long sleeved shirt with a black corset over the top. Finished off with black tights with a seam line up the back and black stiletto platform court shoes. I would wear a stylish plain black shift dress and a pair of killer heels and add this lovely bad for a touch of class. I would wear this beautiful bag with my mum’s vintage black 1960’s LBD, Biba boots and black feather boa, for the ultimate hippy-chick look, groovy! I’d wear a tight knee length LBD to compliment this ba. Sorry, that was meant to say bag. A black dress fitted at the waist with a pearl brooch to add the tiniest detail and dress falling straight down to the toe with little Petal sleeves and a Sweetheart neckline. Double necklace of pearl beads and hair sleeked back. Black shoes. This beautiful bag would make any outfit stand out. I do a lot of needlepoint myself so I can certainly appreciate a work of art. Would absolutely LOVE to win this bag. what a lovely bag, I would wear my audrey hepburn knee length black dress to show off the bag. I like to mix things up a bit so I’d team this with my 1970s salmon pink palazzo pants, a fitted pistachio shirt that I think is from the 80s and a pair of black wedges I picked up new last year. I would put this bag with my midi length silver lace ‘flapper style’ dress. I have a lovely knee length black dress with a daisy neckline that I would wear. To complement the look I’d wear my Office shoes that are black chunky heeled t-bar shoes with a floral print in pinks & greens. I’ve not had chance to wear them yet but they look like they were made just to match this bag – it’s uncanny! I have a beautiful pink cocktail dress the exact same colour as the pale pink in the roses. The dress is very plain, beautifully cut and this bag would compliment it perfectly. A bag like this calls for a really dressy occasion so I would use it on a cruise, it would enhance a multitude of outfits. I am attending two weddings in June (one family, one work related, I intend to wear the same outfit). I have managed to find a lovely, but unusual 1920’s style dress which has a lot of old fashioned beadwork on it. This has caused me a headache since to find a bag to match. I couldn’t believe it when I saw this competition. It would match the style of beadwork on my dress beautifully. It would complete my special outfit for these two special days. I would just feel soooo great. I would wear it with my vintage looking black pleated cos dress with flat black pumps and my own fused glass and red corral necklace. The bag is so beautiful I would keep the outfit quite plain. I would wear a long black skirt, lace tights, with my vintage lace up boot style shoes and a pink pearly button top that looks the same pink as the bag! WOW – now I have looked at it again this would so compliment it! Would need a Hairpin too in gold with a little green/pink on it! With a wrap style tea dress and heels, it really is gorgeous! With a long black satin “Chanel” type dress and matching heels. A little cream coloured vintage tea dress with a pink bow in my hair and black heels! A smart, tailored peplum dress in a classic black or stone. The bag is the only extra statement needed. A Nice pastel Pink dress i bought last week and some killer heels. A plain black dress would go well with this. I have a lovely black maxi dress and an embroidered shawl that would compliment this bag beautifully. I would finish the look with pretty sandals. There are so many things I could wear with this stunning bag! It is such a beautiful bag that could be used when you’re dressed up or down! It would look gorgeous with a long black maxi skirt, plain vest and sandals for a day around the shops. It would also look beautiful dressed up with a LBD and heels! This is definitely a cocktail or evening bag and would absolutely dress up my 1920’s LBD with the dancing fringe below the hem which makes me feel like a million dollars . Vintage ditsy tea dress, black tights & shiny t-bar Mary Jane shoes. Smart black trousers and white spring shirt, new rose necklace and this lovely bag – just perfect! I am a “granny” and I have all sorts of clothes that could be classed as vintage so it would be no problem for me! This lovely bag will go with everything. I’d wear this bag with a black polka dot tea dress and a dainty whity cardigan over the top. The good old classic LBD with a pair of black peep toes! I have a lbd I’d love to wear with it. I would have this on my wedding day to keep my lipstick and essentials in. 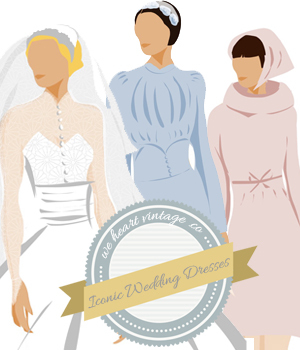 Would look lush with my vintage style wedding dress! I would choose a Vintage short black silk shift dress, a white faux fur stole, plain black tights and chunky dark converse boots. Green nail varnish, a messy up-do and feathery fake lashes too if out for the evening with this mighty fine bag! I think this classic piece would upgrade any outfit! I would try and punk it up a little; I’d wear it with straight-legged navy jeans, a neat, black blazer, and a slouchy vintage band t-shirt. And lashings of attitude. A simple LBD and killer heels! I have got a fantastic little red dress (seems to be the red dress is the new black dress) and some great killer heels which I plan on wearing to a wedding in the summer and this handbag would look great with my outfit. The handbag just looks big enough to hold my purse, mobile, makeup and my emergency ballet shoes. I have a vintage black dress it would go well with. Then I’d get CARRIED AWAY on my way to my DRESStination! What wouldn’t i use this bag for! Of course it would look great with my gorgeous mint green 1940s dress handmade by my gran. However i think it would equally gorgeous with my dark denim jeans, pink shoes and a simple smart tshirt or shirt for a casual but smart girls outfit. I have a stunning blue fitted 50s dress, with lace trim, this would go lovely with it. I have a lovely black dress and knee length boots with thigh length black woolen coat that this would look fab with! I would wear the bag with my 60’s inspired pink shift/mini dress which has crochet detailling on the neckline and on the elbow length sleeves.